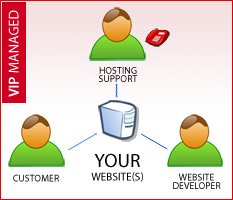 VPS Hosting. Is it worth it? What other providers don't want you to know about VPS and shared hosting. Who needs a VPS and what is it? Is there a better way? Here's a typical problem. Your hosting provider promised you unlimited everything hoping that your site will not grow too large but then it happens. Your site “outgrows” shared hosting and you have no choice but move because you were told by your hosting provider that you are using up a lot of their resources on their already heavily overloaded servers with hundreds of sites. 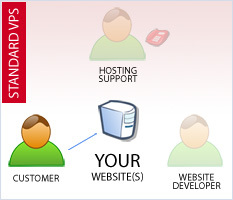 You have no choice but to quickly move to a VPS – virtual private server. A VPS is a virtual server that runs on a physical machine in its own allocated environment. To a user it appears as though it's a separate virtual server but in reality it shares the dedicated server resources where it runs with all other VPSes on that server. This slows down the performance and make any VPS susceptible to the same issues and any low cost shared hosting. By moving to a VPS you are on your own. This can be the end of your site and sometimes online business. In addition to this most providers hate VPSes because the profit margins from them are very low and they are just a pain to deal with. So VPS is basically a stepping stone to a dedicated box. Your provider will make sure you will soon upgrade. We offer a very elegant solution with our VIP hosting package. 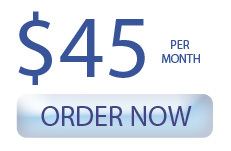 It's priced higher than a VPS service but lower than a dedicated server. Here's how it works: In most cases your site needs to be analyzed and the scripts and queries causing the issues fixed. Also, your site needs more “air” to breathe, more resources not shared with hundreds of other sites. That is what we offer to you with our VIP hosting package. If your current hosting provider is telling you to leave – come to us and we'll make you feel at home. Still have questions? Please use the form on the right side to send us email or give us a call at 1-917-558-8139.